Senior Saints Alive is a ministry to the senior citizens of Riverdale Baptist Church and the surrounding community that shows love and care for our senior citizens who have given so much to so many..
Our Tuesday Luncheons and day trips will refresh and energize you. We share stories, music, God's Word, delicious food and great fellowship. 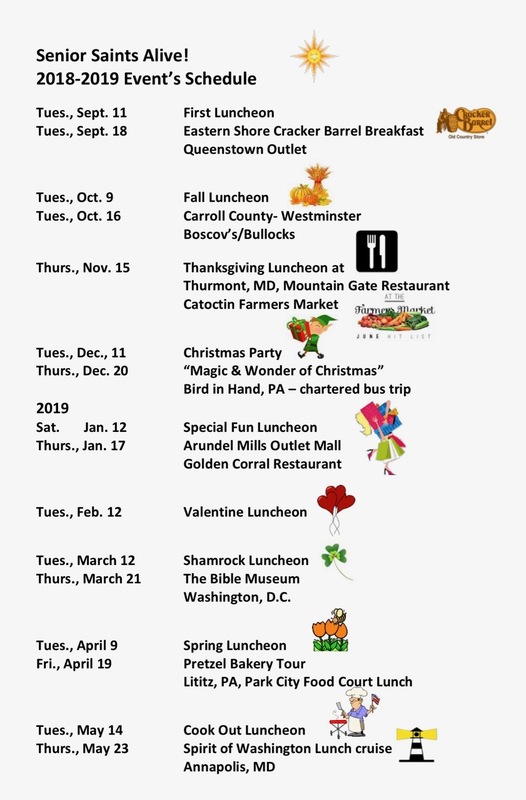 A couple of our favorite day trips are to Sight and Sound in Lancaster, PA and Toby's Dinner Theatre in Columbia, MD. On other trips it's out-to-lunch and a time of shopping at a nearby mall. For more information please contact Bernie Armacost, Director of Senior Ministries, barmacost@riverdalebaptist.org, 301-249-7001, ext. 109.